DeoxIT® DN5 Spray, 5% solution. Chemically improves metal to metal connections and contacts. Non-flammable, quick dry - non drip and safe on plastics! (Large spray applications = 1200 ±). Large Spray (5.75oz) S-CDN5S-6N Packaging Dimensions 5.6 in. x 2.3 in. x 2.3 in. Large Spray (5.75oz) S-CDN5S-6N Weight 0.528 lbs. 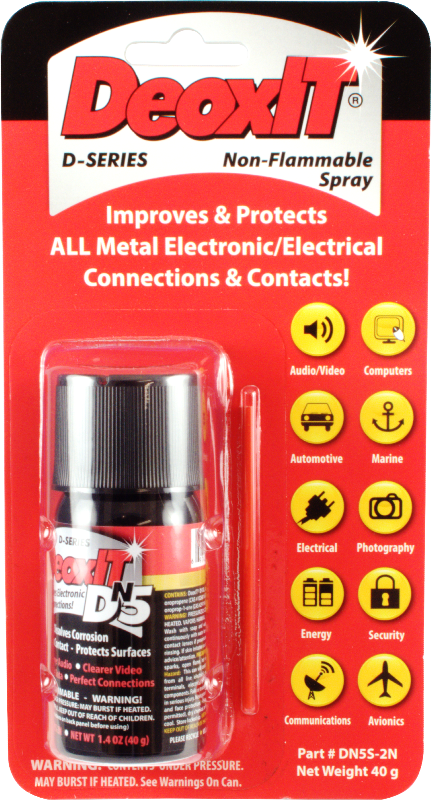 Mini Spray (1.4oz) S-CDN5S-2N Packaging Dimensions 7.5 in. x 4 in. x 1.425 in. Mini Spray (1.4oz) S-CDN5S-2N Weight 0.195 lbs.